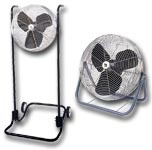 Fan head tilts 360Â° for pinpoint air delivery. Rugged and long-wearing all metal construction. Product No. Fan Dia. Fan Type CFM High CFM Medium CFM Low AMPS High Wt. (lbs.) Price Ea.